Basketball: The St. Francis Brooklyn woman’s basketball team is set to battle it out with Sacred Heart University at home tomorrow afternoon. The Terriers are looking to continue their home winning streak. They haven’t lost a game at home all season. St. Francis Brooklyn broke their eight game winning streak on Monday against Mount St. Mary’s (85-79) in double overtime. Although falling short against the Mountaineers, four Terriers scored in double-figures. Leading was Junior guard Eilidh Simpson as she posted 23 points and 11 rebounds. Senior guard Jasmin Robinson scored a season high of 16 points, ten of which were made in overtime. Junior Katie Fox and Sophomore Leah Fechko each finished with 12 points. It will be interesting to see if Junior foward Sarah Benedetti is playing today. 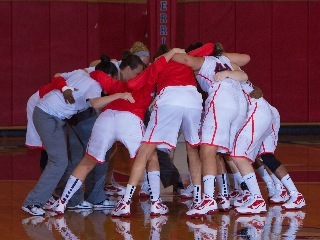 She did not play in the Terriers last game because she rolled her ankle in the LIU Brooklyn game last Saturday. Sarah is an important player for the Terriers. She has been coming off the bench averaging 10.3 points per game and 3.9 rebounds per game. Sarah adds depth to the Terriers bench. The lady Terriers are now 3-1 in the NEC and share a four-way tie with Sacred Heart, Bryant, and Robert Morris. The Sacred Heart University Pioneers also lost their first Northeast Conference match of the season on Monday, with the Pioneers falling to Wagner on Staten Island. The Pioneers fell to Wagner by nine-points, but they played tough defense throughout the entire game. Five Pioneers posted double digits during Wagner’s game. Junior guard Katie Shepard lead the team with 15 points, Freshman guard Adaysha Williams and Junior guard Gabrielle Washington both scored 12 points, Sophomore forward Johanna Lopez reached her career-high of 11 point, and Sophomore guard/forward Hannah Kimmel scored 10. All-NEC preseason selection Gabrielle Washington is the Pioneers leading scorer this season averaging 17.9 points per game and leading the team with 5.5 rebounds per game. Tomorrow’s game marks the 33rd all time meeting between the Terriers and Pioneers. The Pioneers lead the all time series 23-9 and has taken eight of the last 10 meetings against St. Francis Brooklyn. Last season, Sacred Heart University and St. Francis Brooklyn split their regular season matchups and squared off in the 2013 Northeast Conference quarterfinals, which happened to be the first time the Terriers made it in five years. Both St. Francis Brooklyn and Sacred Heart University will be looking to bounce back tomorrow afternoon after suffering losing their first NEC game. Both are hoping to come out on top, their NEC record to 4-1.